Our preschool classroom storage promotes organization. 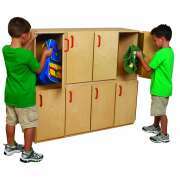 Preschool cubbies ensure that you have enough room for all of your student&apos;s backpacks, art projects and more. 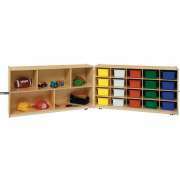 This allows children to store their things and enables teachers to keep supplies neat. How should you organize a preschool classroom? Hertz Furniture&apos;s wide selection of sizes, styles and configurations is sure to include everything you need to organize your learning space. 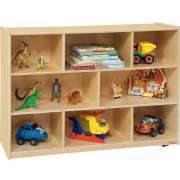 Whether you need toy storage or classroom cubbies, you have come to the right place. Many of our storage solutions come with a complimentary extended warranty. Should I get wood or plastic toy storage? 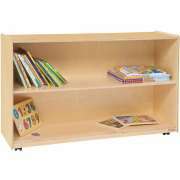 Our preschool shelving is available in either a natural wood finish or colorful Educational Edge style. 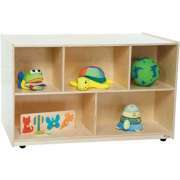 While natural wood is easy to coordinate and very durable, colorful toy storage can add quite a lot to the atmosphere of a learning space. Educational Edge shelving can be coordinated with other brightly-accented preschool and daycare furniture for a classroom full of colors. What kind of cubbies should I get? 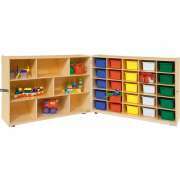 Preschool cubbies come in both single- and double-sided units. 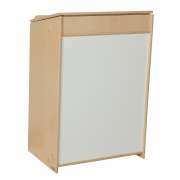 Single-sided is what you want if you are going to place cubbies along the walls of your classroom. Double-sided units offer a perfect way to divide your space into sections. 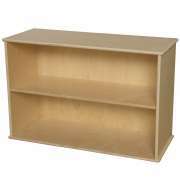 Each side of the shelving can be used in a separate preschool learning center, giving you more classroom storage space just where you need it. 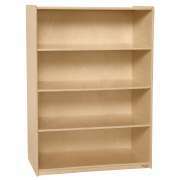 If you really want to maximize every inch of wall space, we have a selection of corner units as well. Not all school buildings are used exclusively for classes. Rooms are often rented out at night, used for after-school activities, or occupied for other purposes on the weekends. 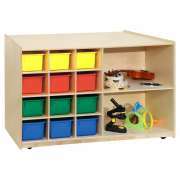 If you have people coming in and out of your classroom when you are not there, you want to make sure that all of your supplies and games stay put in proper toy storage units. Many of our hinged storage units are lockable so you can keep them open when you are there during the day and ensure that school materials stay protected after hours. How can I keep my cubbies neat and organized? 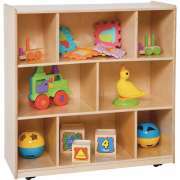 Open shelving can sometimes be challenging to organize because items can fall out and small children may have a hard time balancing toys in the right position. If you are looking for a way to make things easier to find and put away, plastic bins are an excellent solution. Colorful trays offer another way to brighten up your classroom and keep toys organized. Little ones can simply put items in the bins and place them on the correct shelves rather than struggling to balance them in the correct position. 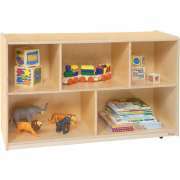 Hertz Furniture has a number of specialized storage solutions for your preschool or daycare. Our wall-mounted bin panels create the perfect place for small art supplies such as popsicle sticks and beads. The portfolio storage center keeps projects organized so they are readily available when you want to display them or send them home with your young artists. Having a hard time keeping track of whose picture is whose and making sure that projects end up in the right backpacks at the end of the day? 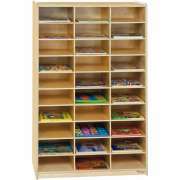 A mail organizer contains enough individual cubbies to provide a personal space for each of your students. You can easily put away projects in the correct cubby and transfer them directly to the right backpacks at the end of the day. 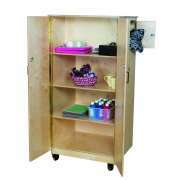 Wooden tot lockers provide personal spaces for larger items such as backpacks and coats. They can fit inside a classroom or out in the hallways. When every child has their own space for backpacks, lunches and outerwear, it is less likely that personal possessions will get mixed up. This arrangement also demonstrates the value of personal space and organization. 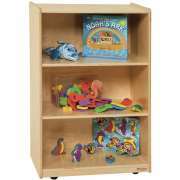 Where can I get mobile toy storage? 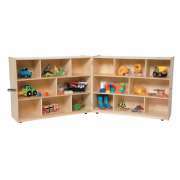 If you have supplies that are shared among a number of classrooms, or you need to clear out your room on occasion, mobile preschool storage is super convenient. 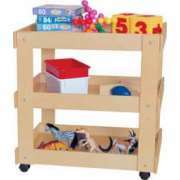 You can simply wheel a cabinet full of supplies to the place where you need them, and roll this toy storage furniture out just as easily when you are finished. 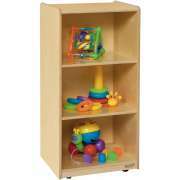 The mobile cubby storage cabinet from Wood Designs is perfect for storing shared art supplies or special themed games. An organized preschool classroom teaches little ones the value of cleanliness and proper treatment of possessions. With Hertz Furniture&apos;s selection of preschool storage, you can furnish an entire early childhood wing or school with great cubbies and shelving. If you need some help choosing which toy storage or preschool cubbies are best suited to your space, contact the Hertz Design Center for free project planning and design consultations.